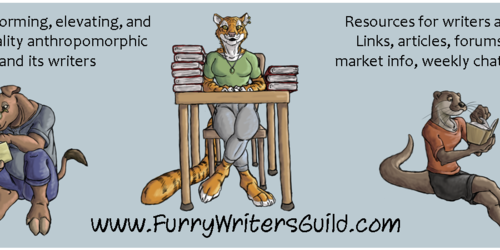 Supporting, informing, elevating, and promoting quality writing and writers of anthropomorphic fiction. 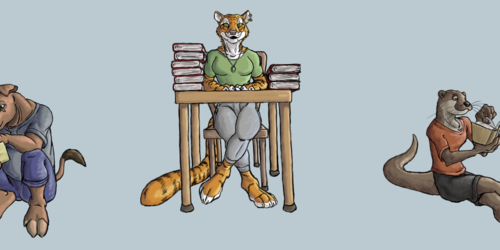 This is the official Weasyl account for the Furry Writers' Guild. Official Guild artwork by mlr. 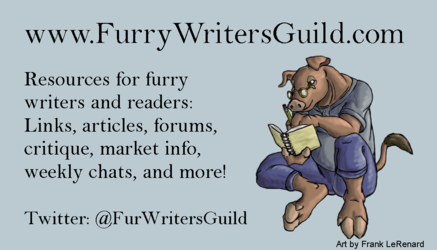 The purpose of the Furry Writers’ Guild is to help support, inform, elevate and promote quality writing and writers of anthropomorphic fiction, as well as to provide useful information, links, and a gathering place for the many writers within the fandom. Interested in joining the guild? Please see the membership requirements here. Weasyl's private notes are disabled; please direct all questions/correspondence to furwritersguild (at) gmail (dot) com. Nominations now open for the 2015 Cóyotl Awards! Please note that we've had two minor category changes: The dividing line between short stories and novellas has been moved from 10,000 words to 20,000 words, and anthologies are no longer required to contain works by three different authors (so that single-author short story collections can be included under the anthology category). You can also follow the Cóyotl Awards on Twitter.